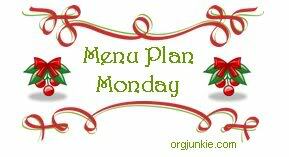 menu plan monday: it’s Christmas! We’re still in school until the 22nd (seriously nuts). Tom’s heading to San Francisco on Tuesday for a check-in with his cardiologist. We’re heading to Grandma’s house Thursday to celebrate with his side of the family and it’s just going to get crazier after that. I’m thinking soups, crock pot and maybe even soups mader earlier in the day staying warm in the crock pot. Anything to bring a little sanity to this week. Also, this week’s plan isn’t strictly paleo – more primal. I’ll probably end up adapting the mushroom soup to be dairy free, but this cold, foggy weather has me craving broccoli cheese soup. No idea. I’ll be helping get ready for Christmas Eve at my grandparent’s, so I’m thinking fast and easy like brinner or tomato soup. Christmas Eve – my grandmother assigned me a vegetable. I’m thinking roasted carrots since they’re easy and will be quick to reheat after church. Dinner: Prime Rib at my parent’s – I’m bringing roasted cauliflower and I think the carrot cake from Make It Paleo. Have a great holiday week and a very Merry Christmas! This entry was posted in Simply Meal Planning, Uncategorized and tagged gluten-free, gluten-free meals, Gluten-free menu plan, meal planning, paleo, Primal by Awkward Girl Gets Fit. Bookmark the permalink.